You know how hard it is to keep your carpet clean of spills and messes on a regular basis, so we have put together some quick tips that you can use to help keep your carpet clean and fresh. By using these tips you'll be able to handle messes that occur with confidence. This is the most important tip that we can offer. The longer you wait - the deeper the stain will reach into the carpet levels and the harder it will be to get it out. If you see a spill and have something else to do, put that other thing on hold and handle the mess right away. You'll save yourself a lot of time and will avoid having a bigger problem to handle later. Blot up the mess carefully making sure that you do not rub the liquid around. You don't want to spread the mess any further than you have to. The more your rub the deeper the mess will go into the carpet, the more spread out it will be on the surface and the more damage it will do to your carpet fibers. 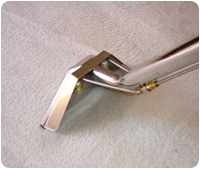 This is a universal carpet cleaner that has proven to be effective on most carpets. Of course, you’ll want to test an area that is in a hidden part of the room first to make sure that your carpet will remain colorfast using this soda as a cleaner. Club soda does not contain any harsh chemicals like the carpet cleaners you'd find at the grocery store and usually does a better job. Once you have finished working the stain out of the carpet don't dry it using a hair dryer. Sometimes it can be difficult to tell whether you have gotten all of the stain out until you see the area drying up. If you apply heat to the stain, and you haven't removed it completely, you will only be setting the stain into your carpet and it will be quite difficult to remove later. It's better to use plain water than a detergent on your carpet. It will be difficult to get all of the detergent out completely and this residue will attract dirt and debris like a magnet afterwards. Call in a carpet cleaning company to do a professional job. If you haven't had your carpets cleaned in a while, it may be time to call them in anyway to get the whole house looking clean and fresh. There aren’t too many stains that a professional company cannot handle, even if you've tried your best to no avail. In many cases, they can remove older stains that you've had in your carpet for years while they're at your home handling the current spill. Article by Sharon Freeman who writes about cleaning and keeping our houses healthy for ECC.